Managing a warehouse is an extremely complicated task, which requires a lot of planning and effort in order to handle it properly. 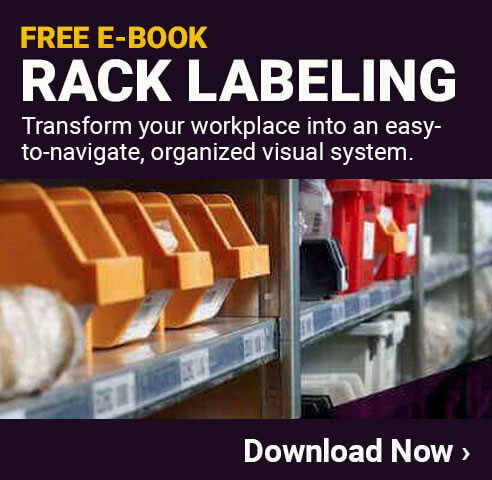 When most people think of a warehouse they picture endless aisles of products that sit on shelves for weeks, months, or longer until they are needed. While there are certainly some warehouses that operate like this, that is far from the norm in today's warehousing industry. Products Go Down in Value - Products often go down in value the older they get, even if they aren't purchased or used. So, if a product is sitting in a warehouse, it is losing value. Risk of Loss or Damage - While most warehouses are safe and secure for products, there is always a risk that something could get lost, stolen, or otherwise damaged. Market Demand Changes - If a company makes 1 million of a particular product to meet future demand and have the products stored in a warehouse until they are needed, there is a significant risk that the market demand will dry up while waiting. Innovation - If a product that is sitting in a warehouse and a new version is innovated, the ones sitting in the warehouse will be much more difficult to sell and may actually need to be sold at a loss. No Profit for Sitting Products - A company is not bringing in money when a product is sitting in a warehouse, but only when it is actually sold to customers. Limited Space - There is only so much room in any given warehouse. If products are stored there for long periods of time, the warehouse will fill up and require additional facilities, which come at a very significant cost. There are many other reasons why it is typically not a good idea to have products sitting on a warehouse shelf for an extended period of time. Good quality warehouse management will help to minimize how long something is stored so that companies can maximize efficiency and profitability. Developing a warehouse management process often takes a lot of planning in order to get right. There are many different strategies that are used today depending on the specific requirements of the warehouse itself. In some cases, the goal is to accept deliveries, organize them, and ship them out as quickly as possible. In other warehouses, the goal is to bring products in and organize them so they can be pulled as they are purchased. 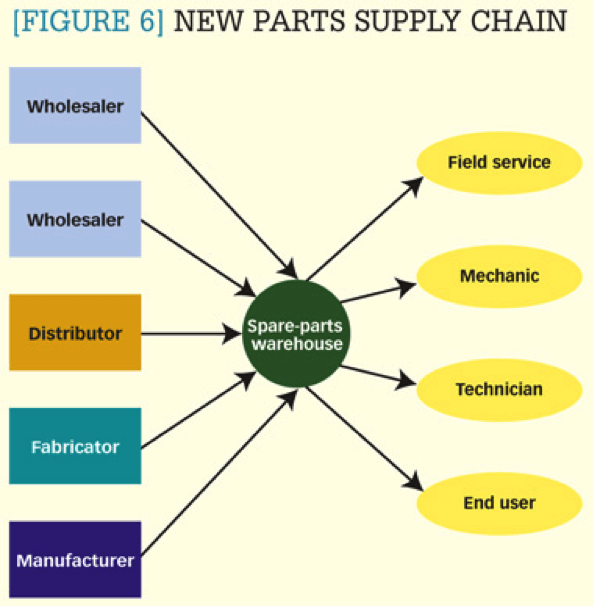 The specific demands of a given company will set the goals, from which a warehouse management process can be developed. 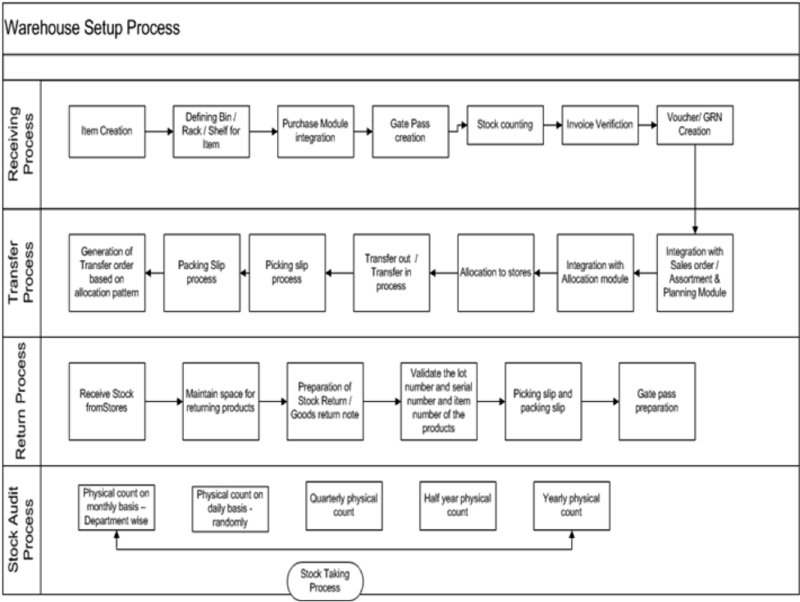 These types of flow charts can be a great way to help facilities be able to follow products along the warehouse management process. If products are getting bottlenecked at any point, having a visual representation of how everything flows through a facility can help to identify what can be done to resolve the issues. Warehouses are an important part of the supply chain of any company. In many cases, warehouses are strategically located in different regions so products can all be shipped to central locations, from which they can be distributed out to the individual stores, or even sent out to actual customers. These types of centralized supply chain warehouses are often called distribution centers because the products are distributed from them. The best examples of these types of warehouses are major retail stores like Walmart and Amazon, as well as shipping companies like UPS and FedEx. 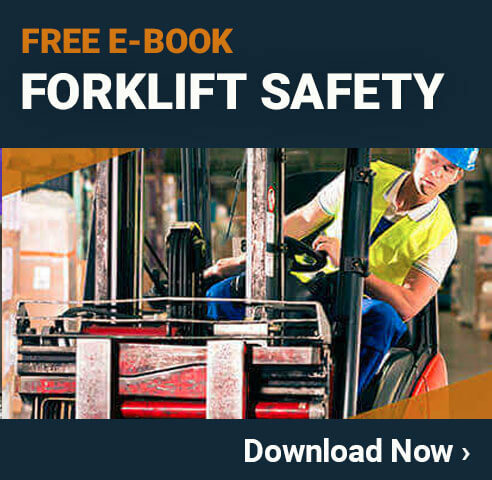 In these types of facilities, warehouse management is an extraordinarily complex system that allows the facility to process hundreds of thousands of products per day. These modern facilities and their advanced systems are what make it possible for companies to operate so efficient and accomplish amazing services for their customers. Products come in from a variety of sources. The necessary products are then sorted and compiled before they are shipped off to their final destination so that customers can access them. By operating these centralized supply chain warehouses, companies save a lot of time and expenses compared to trying to ship individual products to their front line stores directly. There are a lot of different warehouse management solutions that a company can choose from. Any effort that is made to run a warehouse more effectively can increase the efficiency, safety, and profitability of a warehouse. Things like improving safety and efficiency through visual communications, warehouse management software, and other solutions are very popular today and have helped to revolutionize this industry. One of the most important parts of warehouse management is making sure that all the employees working in a given facility can communicate effectively at all times. In many situations, this means using visual communication strategies so that people can understand what is needed even over greater distances or in loud environments. A facility that uses floor marking tape, signs, labels, and other visual communication standards will ensure that everyone can operate quickly and safely. For example, many warehouses mark off the aisles using numbers or letters. These can be identified on the floor using floor marking tape, or up above at the entrance of the aisle. A warehouse management system, or WMS, is a particular type of software solution that is designed specifically to meet the needs of a given warehouse. In most cases, the WMS will need to be either entirely custom made or at least customized to meet those goals. This is because every warehouse is going to have different operating policies. In most cases, the software will be integrated with the warehouse hardware and machinery to automate as much of the work as possible. For example, when a product comes into a warehouse, it is labeled with a barcode, QR code, RFID tag, or other identifying mark. From there, these items can go onto a conveyer belt where the markings are scanned into the warehouse management system. The software will then determine where each item needs to go, and controls the machinery so that it directs each item where it needs to go. Many advanced warehouses are able to accept products, sort them, put them on a shelf, and then ship them out without ever having to have humans involved. In addition to saving money on human resources, a good warehouse management system reduces the risk of items being misplaced, lost, or damaged. This type of automation is also going to allow products to move through a warehouse much more quickly than would otherwise be possible.